Now that the school and community center that it built in Malawi is fully self-sustaining, online casino Slotland.com is concluding its funding. To date, the online slot machine and video poker site has donated more than $100,000 to construct the much needed facilities and train teachers and staff. As the local Project Team moves on to assist other villages another online gambling leader, CasinoRanking.com, has stepped forward to donate at least $10,000 toward ongoing projects. 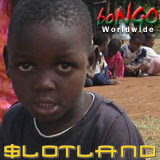 For more than two years, the popular online slot machine and video poker web site, Slotland.com, provided all funding required to construct buildings and train local teachers in the remote and impoverished village of Juma, Malawi. The goal of the African aid project has always been that it should be self-sustaining and since the Project Team built a maize mill to generate ongoing revenue, the centre has required minimal outside funding. But the work of the Project Team isn’t finished. The centre has become a teacher-training center for the region and continues to help other schools in the region get established and improve their teaching methods. The Team has also become involved in the construction of other self-sustaining community projects like a maize mill in Kantimbanye that now provides income for the school in Juma. The story of how the Project Team brought a whole village together to build the Umodzi-Mbame School is told on a fundraising website provided by Slotland: http://www.help-malawi-children-charity.org/. The site also explains how donations will be used by the African charity to assist neighbouring villages that have started similar projects on their own. Donations toward current and new projects can be made on the site through secure PayPal payment processing.